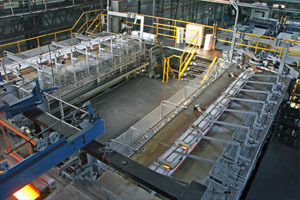 As world-leading specialists in the development, design and supply of all-electric glass melting furnaces, Electroglass offers continuous melting furnaces ranging from 200kg per day to over 200 Tonnes per day capacity, with melting energy efficiencies of 70% to 85% and for most glass types. Electroglass "Electroflex" and "Electroseal" all-electric forehearths offer high energy efficiency solutions for the conditioning of conventional and special glasses from soda lime, borosilicates, fluoride opals and lead crystal. Our range of all-electric distributor channels provide glass distribution and pre-conditioning for applications ranging from the highest capacity container production to low volume special glass products. The Electroflex-W forehearth with channel widths of 48" and 54" is specifically designed for high capacity multiple-gob container production. For specialist hand gathered or machine gathered production, all-electric gathering bay systems are individually designed to suit customer's applications. 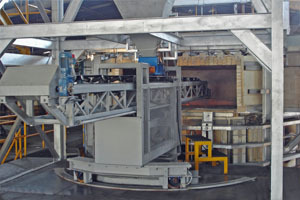 The Electroglass Temptrim thermal homogenisation system employing immersed electrodes is used in both electric and gas-fired forehearths for the ultimate in temperature homogenisation and gob weight control in both high and low volume production. Electroglass electric boosting technology can be used to increase the output of fuel or oxy-fuel fired furnace by up to 60% or more. Electroglass Convection Current Control boosting technology is renowned for exceptional energy efficiency and glass quality improvement, typically achieving major reductions in seed count, stone losses and homogeneity defects. 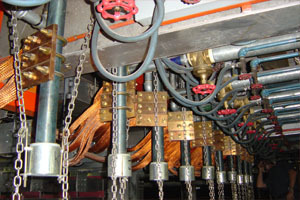 Electroglass boosting technology can be installed in new furnaces or at a furnace repair, and can often be installed hot during furnace operation if required. Electroglass' precision control bubbler systems provide the ultimate in operating flexibility. 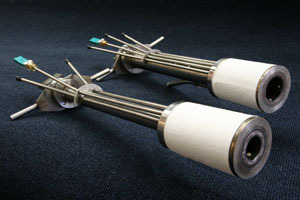 Using state of the art control and Electroglass' unique blockage resistant bubbler injectors, they can be used for hot-spot bubbling, under batch blanket bubbling as well as colour change bubbling. PLC control with colour touch screen interface, allows for multiple user defined patterns to be stored and configured. Time and date stamp allow for historical review allowing operators to make informed decisions. The unique design of our bubbler tubes allows for complete flexibility of bubbling cycle and size of bubble. 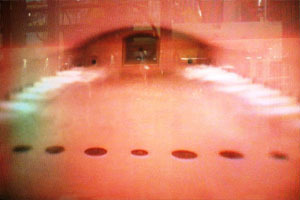 Many systems have been supplied with compressed air as the bubbling medium. These can be bottle fed, stand-alone compressor or factory air supply (with suitable filtration and driers). For speciality glasses, systems can be supplied with platinum coated bubbler injectors and suitable for use with oxygen as the bubbling medium. Electroglass designs, manufactures and supplies a comprehensive range of ancillary systems and equipment, including throat heating systems, glass level sensing systems, continuous controlled drains for furnace and forehearth applications and temptrim forehearth temperature homogenisation systems. Electroglass' range of electric furnace batch charging and distribution systems and Electroglass power and control systems can be incorporated into re-design projects for existing electric melters in many cases. Electroglass' comprehensive range of electrode holders and electrodes includes both water cooled and non water cooled types to suit most immersed electrode glass melting and conditioning applications.